As Members of the House Committee on Small Business, we are writing to inquire about a disconcerting change made to the Small Business Administration’s (SBA) website. As first reported in January 2017, following the inauguration of President Donald Trump, the SBA removed its Lesbian, Gay Bisexual, Transgender (LGBT) Outreach page. As you may recall, Democratic Committee staff discussed this issue with SBA staff in August of 2017. At that time, Committee staff were assured by the agency that the website was under construction with plans to reactivate the webpage in the near future. It has now been over a year since these resources were taken down. Other pages that were also under construction are already up and running. This is deeply troubling and renews our concern that this page’s removal may have been politically or ideologically motivated, rather than simply administrative. As you may know, the nation’s nearly 28 million small businesses, only 964 are certified LGBT Business Enterprises, according to the National Gay and Lesbian Chamber of Commerce (NGLCC). Despite their low numbers, these firms contribute over $1.1 billion to the U.S. economy and realize an average of $2.5 million in revenue each year – almost triple that of other small firms. When considering all 1.4 million LGBT businesses, their offerings are even more staggering with nearly $2 trillion in economic contributions. While most start-ups generally close before their fourth year, the LGBT small entities have been in business an average of 12 years. Data like this strongly suggests LGBT businesses are a critical segment of the nation’s small business community and a powerful force for the economy. You may recall that in 2016, the SBA made history by selecting an NGLCC-certified LGBT business as the small business of the year during that year’s National Small Business Week. This milestone highlighted SBA’s commitment to supporting entrepreneurs of all types, no matter their location or background. Sadly, removal of these webpages suggests the agency may be reversing this progress. It has now been over a year and much of the general SBA website has been updated. This raises troubling questions about why these pages were removed and, equally important, were not prioritized for replacement. 1) Why were these pages originally removed? Was the SBA instructed by White House staff, the Office of Management and Budget or other Trump Administration officials to remove the LGBT Outreach and Certification pages? Please provide any correspondence between the SBA and OMB or the SBA and the White House related to these pages, the decision to remove them and why they have not yet been replaced. 2) When will the outreach be replaced and will it still contain useful information and resources to address the needs of LGBT small businesses? 3) It appears that pages targeting resources to minority, women and veteran business owners remained intact on the agency’s page. Is there a reason that the web pages for LGBT-owned businesses were targeted for removal, while these other pages were left intact? 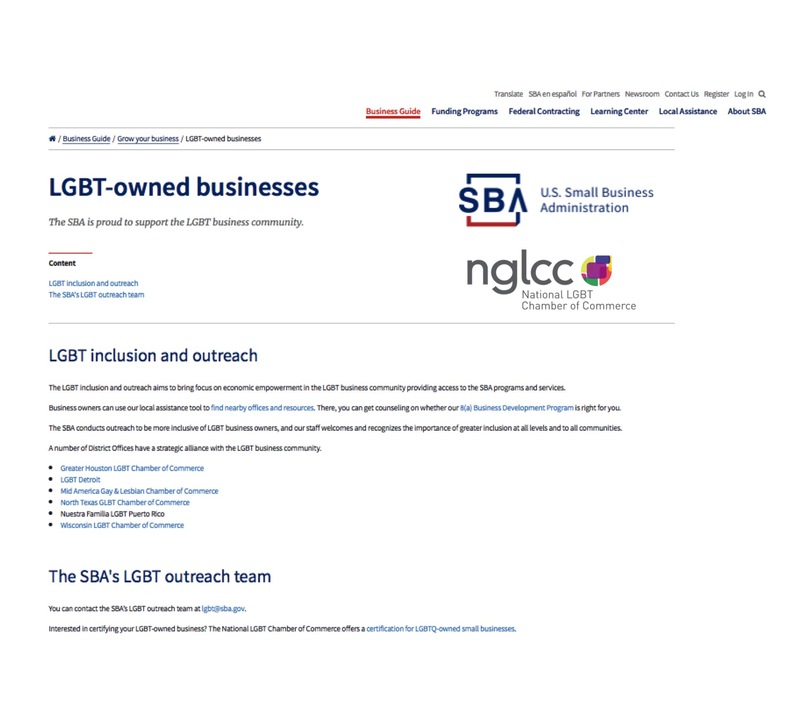 4) Will the LGBT Certification page be restored to provide materials and information related to SBA’s partnership with LGBT-owned businesses? 5) Is the SBA continuing to partner with the National Gay and Lesbian Chamber of Commerce to provide strategic outreach to LGBT business owners? 6) Will the agency commit to continuing to engage with LGBT businesses? Please provide a written response no later than May 22nd.